Imagine you are hanging out with your favorite person and suddenly they put you in your room and walk away. This may make you want to scream -- and if you're an Eclectus parrot, you probably will. Eclectus parrots love to be with their flock and hate to be neglected and ignored. Parrots are intelligent and will quickly see that screaming is a sure-fire way to get your attention. Thankfully, it can be remedied. Eclectus parrots are vocal creatures who spend much of their time talking, squawking and making other sounds. Learning to differentiate each type of vocalization is key to understanding your parrot and what he's trying to say. There is a certain amount of vocalization that's normal and appropriate and shouldn't be discouraged, as that is just who the parrot is as a species. For example, parrots have vocal signals they use to sound an alarm when they're afraid, signal their flock and send out territorial warnings to other birds. Prolonged screaming, however, is something else altogether and should be rectified immediately. A bored parrot can pick up all sorts of nasty behaviors. If your Eclectus does not receive the amount of attention he desires -- and deserves -- he may take to screaming to get noticed. Some parrots exhibit jealous behavior when visitors are over and will scream for attention. Another possibility for a screaming Eclectus is hormonal changes; this species does go through a hormonal period as adolescents that might cause some aggression and unwanted behavior for a short time. This does not mean you should condone the behavior, but at the least understand where it's coming from and respond accordingly. There are several ways to begin teaching your Eclectus that screaming is not acceptable; consistency and patience are key because it will take a little time. Always remain calm and ignore the screaming while it lasts. Never attempt to handle, feed or yell at your Eclectus while he's screaming -- this only reinforces that screaming works to get your attention. Once the screaming stops, reward your Eclectus with a treat or a little play time for being quiet. Once he understands he cannot get your attention by screaming, he should desist. Make sure you provide your Eclectus with plenty of stimulating toys and foraging devices in his cage to ease boredom and prevent bad behaviors while you're gone. Parrots thrive on praise and attention, so give your Eclectus plenty of both when he's behaving properly. Provide attention in the following forms: vocalization, like whistling, singing and speaking; physical contact, like putting him on your arm or shoulder, and petting him; treats designed specifically for birds or fruits and veggies that he loves; teaching him tricks, new words and phrases; and general training, like entering and exiting the cage and stepping onto your arm. 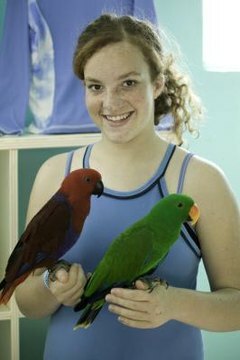 All of these forms of interaction provide positive responses and foster a healthy relationship with your Eclectus. Exotic Bird Hospital: Stop That Biting and Screaming! Alana Krall has been writing professionally since 2008. Her work has been published in "North Valley Magazine," "Vancouver View Magazine," as well as online at VancouverBC.com, YoungEntrepreneur.com and other sources. Krall is currently pursuing a certificate in medical billing and coding.